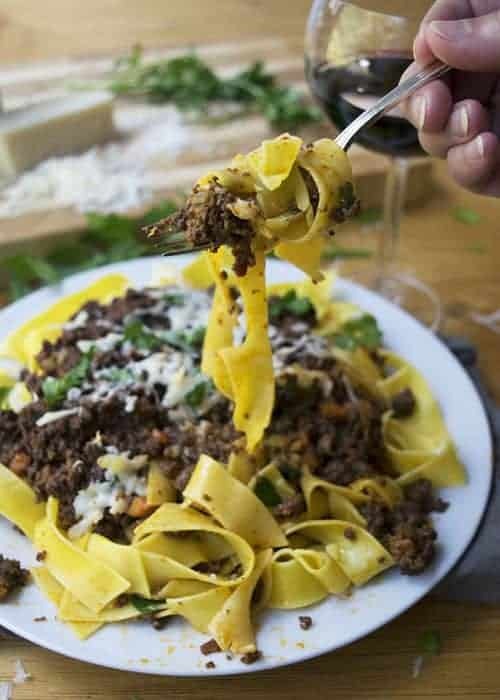 Bolognese is a fancy meat sauce, and my dad LOVES meat sauce. He grew up with it instead of the more traditional spaghetti and meatballs. 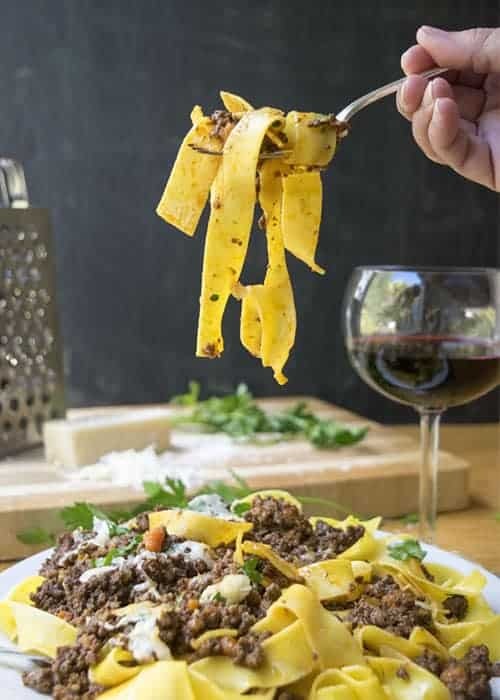 I found out about bolognese one day flipping through a cook book, and I decided to make it for his birthday dinner one year. It is by far his favorite meal now. I put a spin on the traditional bolognese and used chorizo sausage and bacon instead of ground pork and pancetta. The chorizo adds a deeper, spicier flavor and the bacon, well is bacon. What could be better? To start this recipe sizzle up some chopped bacon. Ah! 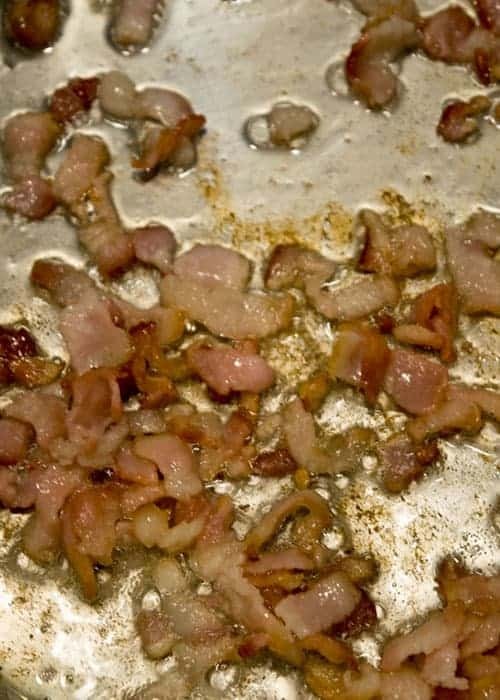 Enjoy that fried bacon smell. Then add in the rest of the meat to brown. Add in your chopped vegetables. Add the tomato paste, wine and broth and cook for an hour and a half. Finish off this glorious sauce with 1/4 cup heavy cream. Yum. WARNING: You will fall in love, and meat sauce will never be the same. 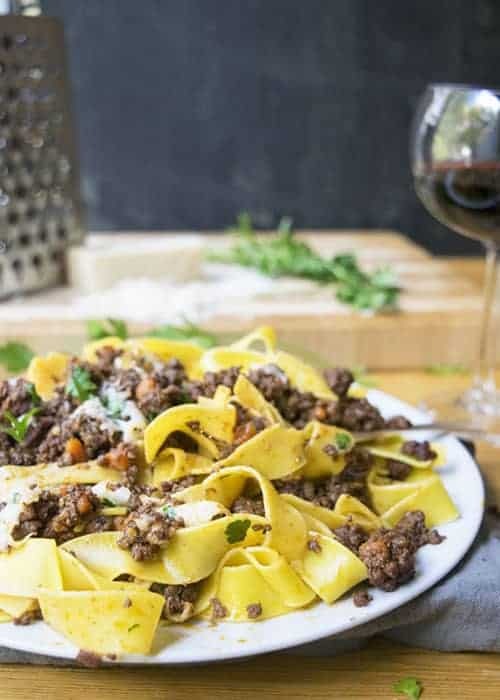 Bolognese is a fancy meat sauce. I change it up using chorizo, bacon, and heavy cream. This meal has rich flavors that will leave you completely satisfied. Heat up a large pot over medium high. Start by cutting up the bacon strips into small pieces. Place the bacon into the hot pot, and brown for 2-3 minutes. Add the chorizo and ground beef to the hot pot and break into pieces. 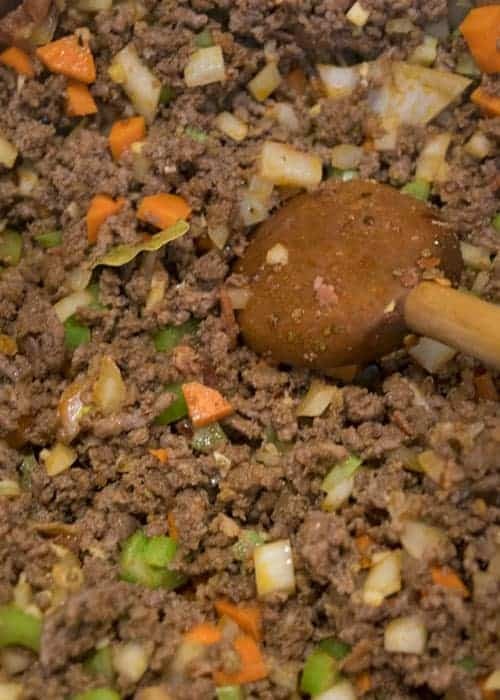 Once the meat has browned add the garlic, carrot, celery, and onion to the pot. Cook until the vegetables are soft (around 3-4 minutes). 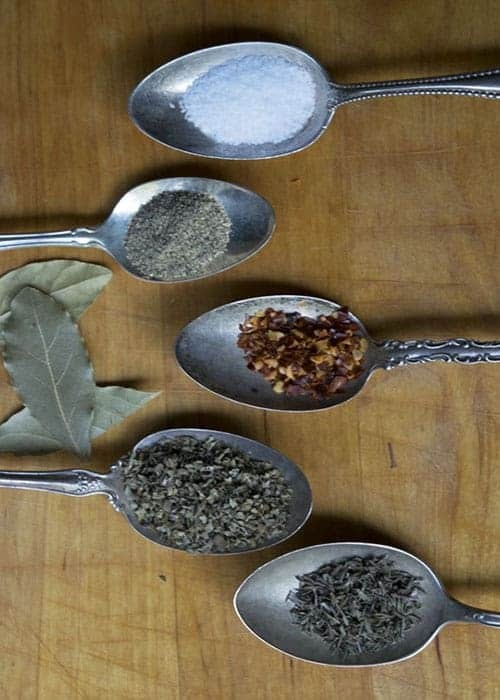 Add the bay leaves, oregano or margarom, thyme, red pepper flakes, salt and pepper to the meat mixture. Stir for 1-2 minutes, then add the tomato paste and continue stirring. Once the tomato paste is thoroughly combined into the meat/vegetable mixture, add the red wine. Cook the red wine down for around 5 minutes. When the wine has reduced down, add the beef stock and bring to a slight boil. Reduce the heat to low and cover with a lid. Cook for 1 1/2- 2 hours. Turn off the heat, and pour in the heavy cream. Serve over your favorite pasta noodles. Pile on some Parmesan and enjoy! 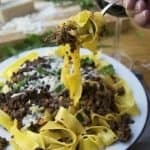 I use parpardelle noodles, but you can use any noodle you like!